Customer Care Management, commonly referred to as Customer Relationship Management (CRM) in the business world, is a term that refers to strategies, practices, and technologies used to analyze and manage patient interactions with healthcare providers throughout the patient-care lifecycle. Customer care management systems are therefore software or applications that enable care organizations to manage their patient’s care; with the aim of improving care delivery, boosting patient-provider relationships, enhancing patient retention through satisfactory service delivery, streamlining processes, and driving down care costs. Healthcare systems in the United States have embarked on a journey to employ the triple aim; that is, improving the quality/experience of care delivery, improving population health, and lowering per capita costs of healthcare, as their guide to transforming the healthcare landscape. Understanding and properly managing population health is core to each of these aims, and care management has surfaced as a top practice-based approach for managing the health of populations effectively. Basically, Customer/Patient care management systems consolidate patient’s information, files, and documents into a single database so that healthcare providers can more easily access and manage it. In the past, it had always been a problem for healthcare providers across different platforms to coordinate and deliver centralized care to patients. There was also poor coordination between providers and patients given the complexity of care surrounding patients working with several different providers. Such patients faced the challenge of constantly having to log in, update, and communicate their state of care; a hectic process that many patients just decided not to follow through with. Today, with advancements in technology and hence the adoption of patient care management systems in healthcare facilities, all members involved in a patient’s care have access to a platform that enables them to quickly understand the current state of the patient, their health, as well as their future path/plan of care. If designed appropriately, a good care management system additionally facilitates updates and information sharing amongst all the care-delivery stakeholders. 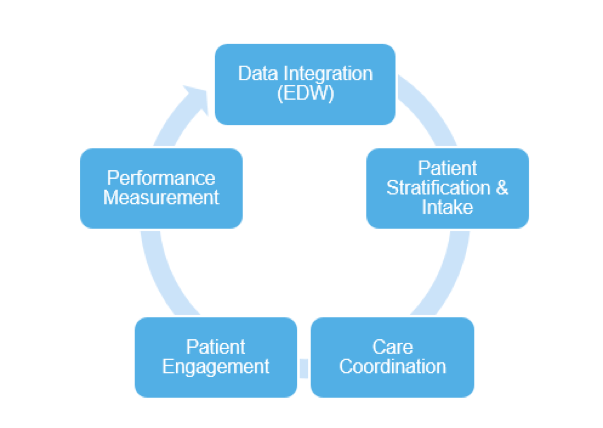 Through care management systems, collaboration and coordination in care delivery are enhanced. All members involved with the patient’s health, from care managers to physicians, nurses and home caregivers, use the collaborative platform to manage patient care. The care systems, through coordination, also ensure the delivery of appropriate services to patients is streamlined while simultaneously providing the most cost-effective outcomes for care providers. • Analysis of the performance of routine processes over time including admissions, transfers, discharges, and referrals, to get rid of any unnecessary steps of practices that hinder care delivery and hence affect patient satisfaction. • Developing customized workflows that automate the coordination of care delivery activities across or among provider organizations such as the hospital, physical office, and home care delivery. This leads to increased operational efficiency, enhanced patient outcomes, and definitely reduced costs. • Proactively managing and coordinating care for chronically ill patients. This can be through giving information on educational offerings as well as by reminding them of ways to manage their illnesses. • Managing and lowering health care costs by pulling together systems and resources to obtain economies of scale. Coordination and collaboration also enhance the use of the right healthcare resources and provides an understanding of treatment expenses to help drive business planning. • Averting and mitigating medical errors through the integration of care management systems with clinical data and patient’s medical history. • Generating targeted marketing campaigns to specific patient types with the use of data analytics and feedback mechanisms. This can help identify and support self-care efforts and hence ensure there are quality outcomes generally. • Empowering population health by driving efficiency through a unified process of disease management, care management, as well as health and wellness. Customer/Patient care management systems are a key tool in the transformation of health care delivery in the United States. There are many different companies offering these systems, and your best bet in getting the one most suitable to your operations is doing thorough research. Armed with the information of ongoing patterns in care coordination, as well as taking into consideration all the regulations and reporting that must be done in healthcare, organizations can find out where changes need to be made, make better and more defined goals, and eliminate wastes that happen with time, energy, resources, and personnel. This information, in addition, can be used to deliver better customer care service to patients. When an organization has proper systems in place for care coordination it also translates into proper customer care. Customer care is not just for patients but for families of patients, hopsital visitors and stakeholders of the hospital. All of these together help to answer the question: what is an ACO? The hardest aspect in all of this is that the healthcare industry is trying to hit a moving target; no matter what they have gotten right in the past may not be enough for today’s standards, and may not be enough to meet new government mandates. However, with the right tools and knowledge, that moving target can be a lot easier to hit, and in the process, help to provide better care for patients and keep the cost associated with care under control. Proper patient coordination also reduces cost and helps to keep care teams in sync to focus the goals of the organization in other important areas. It also opens up resources as it streamlines the process and reduces the occurrence of redundancies or revenue stream leakages.